There is a new version of this tutorial available for openSUSE 12.2. 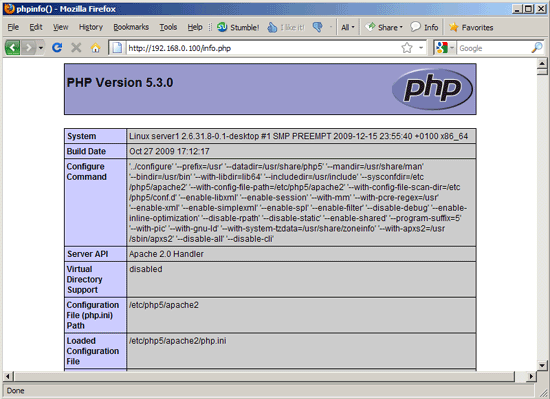 This guide explains how to set up mod_chroot with Apache2 on an OpenSUSE 11.2 system. With mod_chroot, you can run Apache2 in a secure chroot environment and make your server less vulnerable to break-in attempts that try to exploit vulnerabilities in Apache2 or your installed web applications. I'm assuming that you have a running OpenSUSE 11.2 system with a working Apache2, e.g. as shown in this tutorial: The Perfect Server - OpenSUSE 11.2 x86_64 [ISPConfig 2]. In addition to that I assume that you have one or more web sites set up within the /srv/www directory (e.g. if you use ISPConfig). Next we must tell our vhosts that the document root has changed (for example, a DocumentRoot /srv/www translates now to DocumentRoot /). We can do this either by changing the DocumentRoot directive of each vhost, or more easier, by creating a symlink in the file system. Let's assume we have a vhost with DocumentRoot /srv/www. We must now open the vhost configuration of that vhost and change DocumentRoot /srv/www to DocumentRoot /. Accordingly, DocumentRoot /srv/www/web1/web would now translate to DocumentRoot /web1/web, and so on. If you want to use this method, you must change the DocumentRoot for every single vhost. That's it. You can now call your web pages as before, and they should be served without problems, as long as they are static HTML files or using mod_php. If you are using CGI, e.g. Perl, suPHP, Ruby, etc., then you must copy the interpreter (e.g. /usr/bin/perl, /usr/sbin/suphp, etc.) to the chroot jail together with all libraries needed by the interpreter. You can find out about the required libraries with the ldd command, e.g. If you've copied all required files, but the page still isn't working, you should take a look at the Apache error log. Usually it tells you where the problem is. Also read http://core.segfault.pl/~hobbit/mod_chroot/caveats.html for known problems and solutions. there is a repository for mod_chroot which can be integrated into yast2, so you won't have to compile your own mod_chroot. Look at http://software.opensuse.org and search for mod_chroot. It's also available there for other versions than 11.2. Hopefully this makes upgrading Apache or a whole system a little less painful.